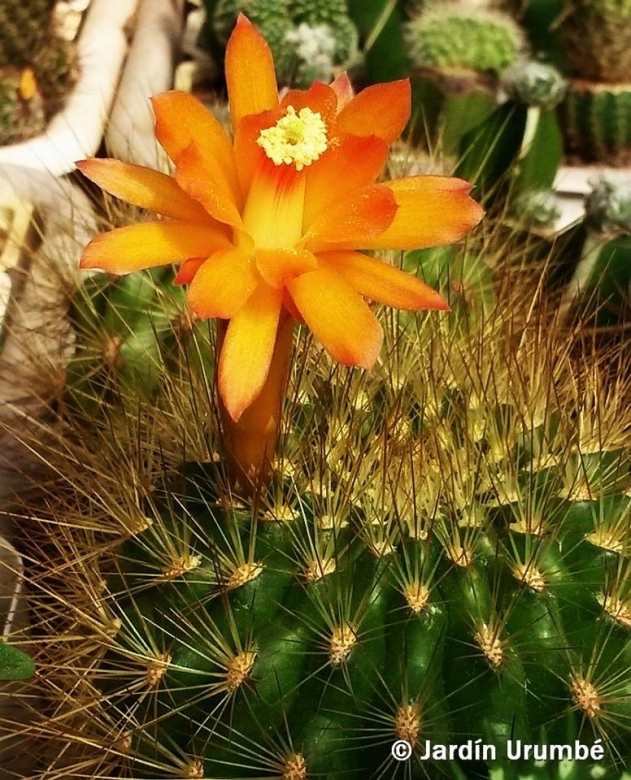 Origin and Habitat: Matucana weberbaueri is known from one location between Balsas and Chachapoyas, west side of the Rio Maranon in the department of Amazonas in Peru (extent of occurrence 100 km2). The species grows in inaccessible land and it is likely that more populations exist. Altitude Between (1200-)2000 and 2500 metres above sea level. Habitat and Ecology: The species grows in montane oriental forest on humid substrates. M. weberbaueri is usually solitary. It is subject to illegal collection that causes steady declines in the population. 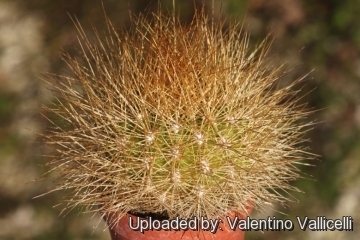 Description: Matucana weberbaueri is a low-growing, perennial stem succulent densely covered by golden yellow spines. 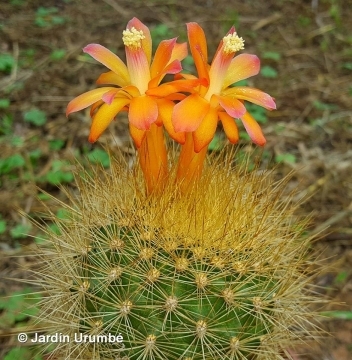 This plant is a possible eastern relative of Matucana aurantiaca but differing in having more numerous spines (25-40) and small flowers. Stem: Depressed to somewhat cylindrical (particularly in cultivation), green 10-12(-15) cm broad, about 7 cm tall rarely up to 20 cm. Ribs: 18-30, with transverse ridges, forming terete, conical tubercles. Spines: Varying from 25 to 40, golden to dark brown, becoming blackish with time, not differentiated as centrals and radials, straight, finely needle-like, the longer ones 5 cm long. Flowers: Lemon yellow to orange, slim-tubed, straight to slightly oblique or zigomorphyc 5,5-6 cm. long and 3 cm in diameter. Ovary and flower-tube greenish-yellow, less than 8 mm in diameter, bearing lanceolate acute scales, these without (or with very few) hairs in their axils. Style white, stigma lobes 5-6 green about 2 mm long. Fruits: Oval, green and red, to 13 mm long and 8 mm in diameter covered with small scales. Seeds: About 1 mm thick and 1,2 to 1,8 mm long. Remarks: Matucana weberbaueri along with the related Matucana formosa, Matucana inertexta, Matucana huagalensis and Matucana ritteri is part of the Matucana aurantiaca group. 7) Ostalaza, C. & Cáceres, F. 2013. Matucana weberbaueri. The IUCN Red List of Threatened Species 2013: e.T152532A647621. http://dx.doi.org/10.2305/IUCN.UK.2013-1.RLTS.T152532A647621.en. Downloaded on 20 November 2016. 8) Arakaki, M., Ostolaza, C., Cáceres, F. and Roque, J. “Cactaceae endémicas del Perú.” Revista Peruana de Biología 13(2): 193s-291s. 2006. Cultivation and Propagation: Matucana weberbaueri is a summer-growing species of relatively easy cultivation. This plant is adapted to dry soils and is quite susceptible to over-watering if kept in a non ventilated place.